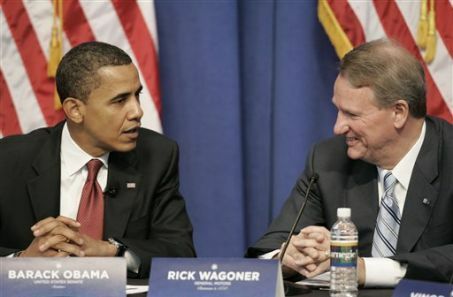 Media reports tonight (March 29, 2009) say Rick Wagoner, under pressure from the Obama administration, is resigning immediately as the Chairman and CEO of General Motors. This really shouldn’t surprise anyone; during his tenure, the automaker has failed miserably in so many areas, the most important of which is making money. Through the media lens he often came across as a very nice guy but out of touch and unable or unwilling to confront reality. We all know people like this and many of us might recognize similar traits in ourselves from time to time. It appears that the Obama administration’s precondition for any more bailout funding was Wagoner’s head, which raises a whole bunch of interesting questions. Who will succeed him? How much influence will the Obama administration have on the choice? What’s the boards role in all this? Should and will the board be replaced as well? Government is getting much more deeply involved in America’s business but really how far can they go before they erode the basic tenets of the capitalist system the United States has been built on. These are very challenging times and there are no easy answers. If you “invest” billions of dollars in failing industries you get the right to make some changes. While there’s no guarantee that these changes will get everything back on course, the system has been broken for sometime and change is required. Was Rick Wagoner a sacrificial CEO? I think so. But it’s really about more than GM or even the auto industry. The administration is sending a message and CEO’s and boards across the country should take notice that it’s not “business as usual” anymore. What’s next? Who knows, we’re in uncharted waters. Tagged with CEOs, GM, President Barack Obama.